There's a celebratory light at both ends of Seattle's new SR 99 tunnel. We're hosting a family-friendly Grand Opening event on February 2 and 3 so visitors can explore the new tunnel and enjoy one last visit on the Alaskan Way Viaduct. More than 25,000 have already signed up for the 8K Fun Run through the tunnel and on the viaduct - sponsored by HNTB. These events are a once-in-a-lifetime opportunity to see the past, present, and future of the Seattle waterfront in one afternoon. But if you're coming, you need to be prepared. 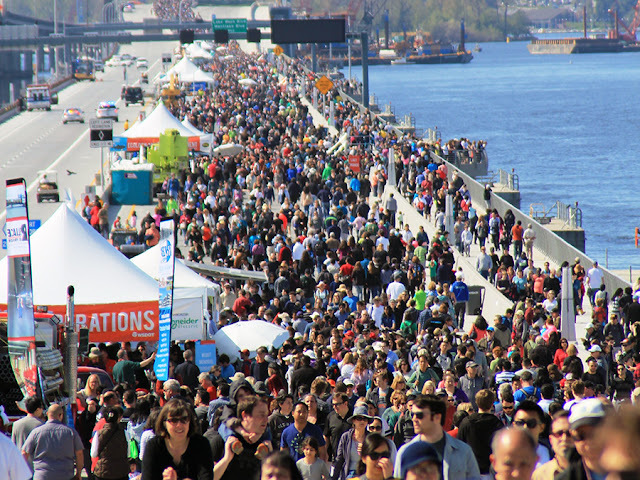 Similar to the 2016 SR 520 Grand Opening, we’re expecting big crowds for the Step Forward event. If you've signed up, show up. Be sure to get to the event within 15 minutes of the time you signed up for. For example, if you signed up to tour the tunnel at 12:30 p.m. and don't show up until 1:15 – you may have to wait in line. The tickets were issued during time slots to better manage crowd flow. If you don't have a free ticket, there will be lines for non-ticketed guests. We believe the best arrival window for un-ticketed guests will be between 1:30 and 5:30 p.m. We plan to accommodate all un-ticketed guests, however, we are not able to guarantee access if the wait extends past the 6:30 p.m. end time. Take public transportation. You don't want to get stuck. There is limited parking near the event entrances but plenty of transit options, including the monorail. And remember that the #Realign99 closure is still on, so you need to be prepared. Be a good visitor! We expect crowds. Please be patient and considerate of others. We want you to enjoy all the events, but remember there are others who want to come join you, so please make room for them so that everyone can enjoy the event. Plan to walk a lot. The tunnel is 2 miles long and the viaduct is about 1.5 miles. Be sure to hydrate, dress appropriately and plan to spend a lot of time on your feet. The viaduct road surface is not in the best condition, so plan to wear comfortable, sturdy walking shoes. I signed up for 2 tickets but never received a confirmation. How do I reconfirm my time slot? Hi, A.V. Please contact viaduct@wsdot.wa.gov, and we can resend your ticket confirmation email.